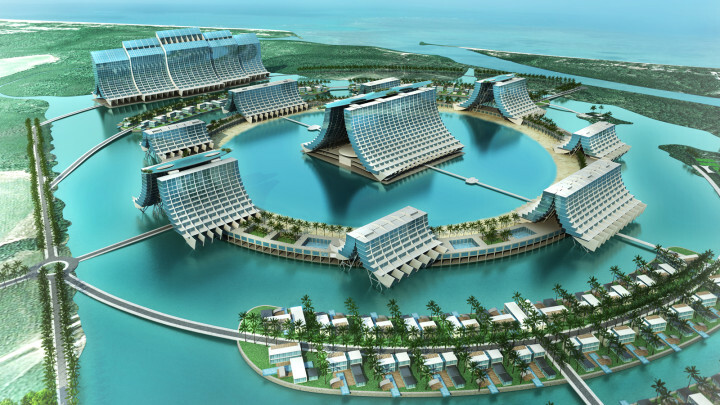 Chinese billionaire and developer Tony Fung is proposing to build his Macau style mega-casino and resort, the Aquis Great Barrier Reef Resort, on the Cairns northern beach of Yorkeys Knob. The $4.3 billion casino will have 9 luxury hotels, a convention centre, 2 x 2500-seat theatres, golf course, sports stadium, shopping and mega aquarium. In August of this year, The QLD Government declared it a ‘Coordinated Project’, giving it a streamlined approval process to be overseen by the Coordinator General’s office. What will be Australia’s largest casino aims to lure Chinese and Asian high-rollers to gamble their fortunes on the pristine shores of Cairns. However, there are a huge number of concerns which are yet to be addressed, hidden behind the bold promises. In a media campaign which has prominently featured in Cairns media for the last few months, little is known about the mega development outside of Cairns. There are well founded concerns about the impact of the massive development on the Great Barrier Reef, an irreplaceable ecosystem that is one of the most beautiful and unique in the world. Both the Australian Marine Conservation Society and the Cairns and Far North Environment Centre have expressed alarm at the size, scale and coastal location of the mega development. What the streamlined approval status given to this development really means is that it can circumvent the usual stringent environmental and social assessments required of a large development in an environmentally sensitive area. In an open letter accompanying the proposal of his casino, Fung explains that Cairns is missing a man-made wonder, such as the gambling hub Macau. However, the environment of Macau has deteriorated rapidly since 2002, when the government signed contracts with two large gaming companies. Problems include water management, electricity consumption, waste collection, urbanisation and pollution. Per capita, Cairns is Queensland’s highest spending pokie city, with the average resident spending $45.41 per month on pokies in 2012. Fung is asking the State Government to approve 1500 pokies for his reef development, the same number as Sydney’s Star City. At 750, the number of proposed gaming tables exceeds that of Australia’s two largest casinos (Crown and Star City) combined. Cairns already has a large casino, does it really need another? Proponents say that the Aquis casino will encourage badly needed investment in the region. However, many feel that Cairns should be diversifying away from tourism, not increasing its dependence on the tourist dollar. Like tourism in general, the nature of the gambling industry is unstable. It’s not susceptible to technological advancement or productivity growth and so the success of the Aquis casino will be dependent on the prosperity of other Asian economies. Local business is impacted when you centralise shopping, restaurants, entertainment, accommodation etc. into one facility. With everything in one resort, Aquis visitors will have a significantly reduced need to leave the complex, meaning small businesses may have to downsize or close altogether. Tourists, both domestic and international, continue to choose Cairns for reasons primarily centred around the Great Barrier Reef and the Daintree Rainforest. These tourists are not going to suddenly start pouring in because Cairns has a few more resorts, a second casino and a stadium. Tourists come to Cairns for the beauty, the tropical environment, the slow pace and most importantly, because it is unspoilt. Turning the city into a tacky, flashy hub for Asian gamblers has the potential to discourage the huge numbers of tourists who flock to Cairns for the natural, not made made, wonders. Yorkeys Knob resident and reigning ‘King of the Knob’ Jim Cadman believes it is ludicrous that the mega development could be allowed to take place in such a pristine area. Over 80 meters high in some parts, Aquis will disturb the stunning mountain and sea views of the area and will tower over Yorkeys Knob. The estimated surge in property value associated with the development, has the potential to drive out residents who face increased rent. In recent weeks, QLD Premier Campbell Newman has announced that two further licenses for mega-casinos will be given in QLD, in Brisbane and the Gold Coast. In the coming years, the government is set to reap the benefits of the hugely increased gambling revenue raised by these. Creating a state of mega casinos which relies heavily on gambling revenue can not be considered a sound approach to sustainable economic development. We should not allow the Queensland Government to risk the pristine environment of the Cairns northern beaches for this short term economic gain.